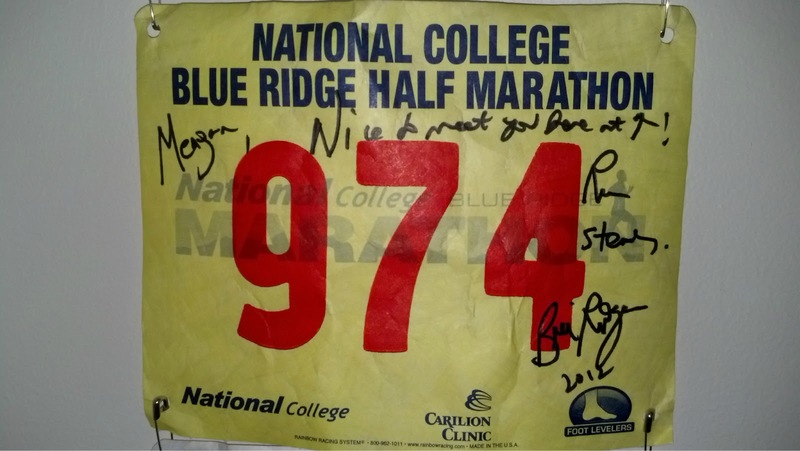 Saturday I will be running the Blue Ridge Half Marathon in Roanoke, VA for the second year in a row. The race coins itself as “America’s Toughest Road Marathon”. And it just may be with 7,440 feet in total elevation change for the full and 2,734 feet in total elevation change for the half. 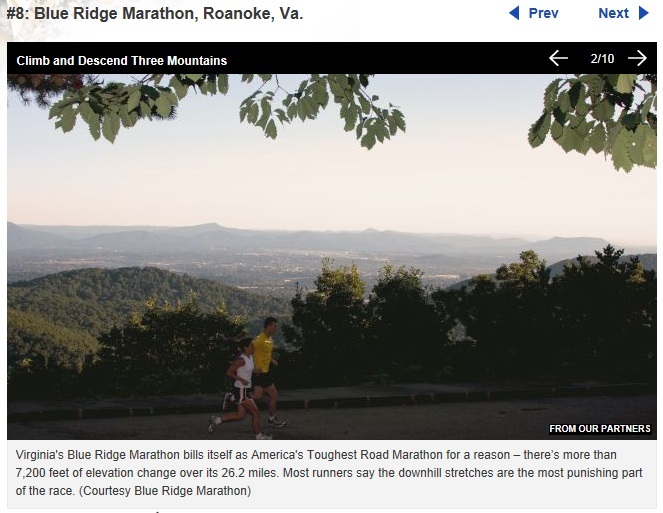 The Weather Channel agreed, and ranked the Blue Ridge among their list of “The World’s Toughest Marathons” (which included road and trail marathons). **Note: This elevation is for the 2013 race, which reflects a detour late in the race due to flooding. The detour added an extra 206 feet of elevation change. Last year this race chewed me up and spit me out. I ran a time of 2:45:48, which was almost a personal worst (we won’t talk about the 2009 Baltimore Half when I ran with a bad chest cold and hadn’t trained properly). I went into the race expecting to run/walk to the top of the mountain and then run the rest of the race. Obviously that didn’t happen. 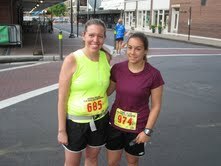 Pre-race picture with my running buddy Kim, with no idea of what was to come. I ran/walked to the top of the mountain as expected, and was running with my running buddy Nicki (who has since moved to Texas… boo). We passed the star and I was so happy we had conquered the mountain! Now all I had to do was run down the other side of the mountain, and then run around town to the finish. As we were coming down the mountain, which was a sharp descent for about 1.5 miles or so, I could feel my quads becoming more and more tired. I also got nauseous for a bit, but I think that was just from the water in my stomach sloshing as we went downhill. When we made it to the bottom I felt like I was done. I stopped to take a walk break and urged Nicki to keep on running, but she stayed with me and would stick by my side the entire race. The rest of the race was a mix of walking and running until we finally made it to mile 12. At that point we saw Barry, who had come back to collect me as he often does at races, and I dug deep to run the one mile to the finish. That’s right, running just one mile without stopping seemed impossible at that point. 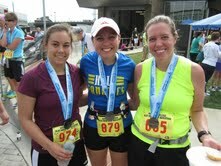 Me, Nicki, and Kim at the finish. I’ve never been happier to just be done. I have thought about last year’s race over and over again, and to this day I have no idea what happened. I guess I just “bonked” and had a really off day. Based on this, I’m not sure how to approach the race this year. 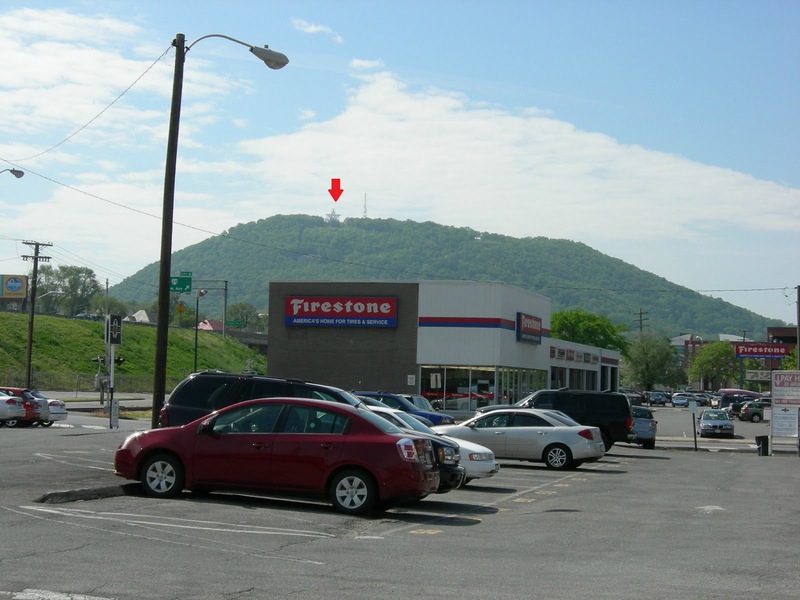 I’m not sure what other strategy to use other than run/walk up to the Mill Mountain Star. Maybe it truly was just an off day last year and things will go better on Saturday. I sure hope so! One awesome thing about the race last year was that Bill Rogers was there. We got to meet him and talk to him at the race expo AND he signed my race bib! It says “Meagan, Nice to meet you here at [arrow pointing to the race name]! Run strong. Bill Rogers 2012”. We’re basically BFF’s now. This year Bill Rogers will be back again, along with Bart Yasso and Frank Shorter. They had a “Run with the Legends” contest where two lucky runners will get to run the 5 person marathon relay team with those three. How cool is that!? I’m crossing my fingers that they will be at the expo this year and that I can meet them and/or get a picture! Either way, I hope at the end of the race this Saturday I am smiling more from being happy than just from relief that it’s over and I survived. What is the toughest race you have ever run? It’s a toss up between Blue Ridge and the Varmint. Have you ever met a “running legend”? Who was it?? Ahh good luck! My roommates and I wanted to do the relay but decided against it since our half is next weekend. You’re gonna rock it! Good luck!! I think the run/walk strategy is a great plan. Going steep downhill for that long would be killer on the quads!! None of my races have ever really been THAT hard. In Colorado there’a Pikes Peak Marathon and Pikes Peak Ascent, which runs up one of the 14,000 feet mountains in Colorado. It starts at like 6000 feet or something…and you just run straight up and then straight back down! Crazy!! You actually have to qualify for it with another marathon time. I have never met another running legend, but Scott Jurek ran the GW Parkway Classic last year and I was cheering and saw him! The race is actually again this weekend – I’m cheering on my sister and BIL and I’m going to try to bike alongside the course and cheer for them in a few places. I can’t wait to hear about the race!! Pikes Peak sounds intense! I think I would get altitude sickness. Have a great time cheering at the race! I always love being a spectator, it’s so exciting! Hope you get to see Deb run by! Good Luck! I did a 17 mile trail race in CO a couple years ago that took us up to 13,000 ft. They offered us warm chicken broth and hot chocolate at the top after 10 miles. Then we had to go down the other side and run down for 7 miles. Whew that race sounds t-o-u-g-h!! I can’t imagine what the temperature differnce was from the start to the peak elevation. Warm chicken broth probably hit the spot. I’m sooooooo sad to not be running this year. I ran the first 3 years, and it is still my favorite race. Good luck Meagan!! Can’t wait to read your post and hear all about it!! I’ll run for you 🙂 And I promise I’ll do a little more running than I did last year, haha. Good luck at tomorrow’s Blue Ridge Half! I hope this year’s experience is a great one. I got to meet Dean Karnazes after The North Face Endurance Challenge Marathon, and I’ve met Jeff Galloway several different times. Jeff and his wife were running at about the same pace as me at last year’s Virginia Wine Country Half, and that was cool. Big Sur was probably our most difficult marathon; but wow, was it gorgeous running along the Pacific Ocean! How cool to meet Dean Karnazes! I loved his book 50 marathons, 50 states, 50 days. Also too cool that you ran with Jeff Galloway and his wife! I’ve heard Big Sur is really challenging, but absolutely gorgeous like you said.